The governments move to recall Rs 500 and Rs 1,000 currency notes is the topic of most drawing room discussions nowadays. 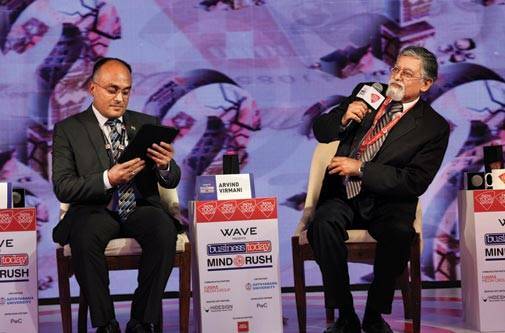 The fourth edition of BT MindRush was not any different, with top economists and officials enriching the event with their diverse views, and the government defending the move with all the intellectual power at its command. 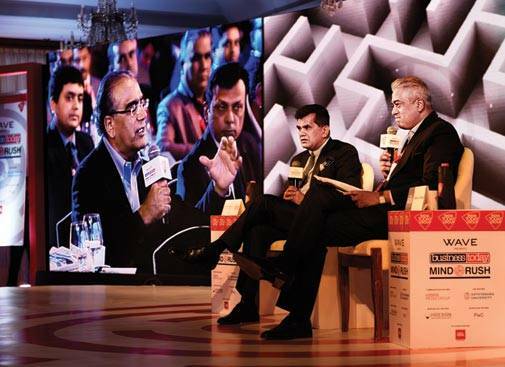 The mornings session saw Amitabh Kant, the CEO of Niti Aayog, directly take on criticism that demonetisation will cause long-term damage to the country's economy and said it was a necessary move for India to make any serious attempt to grow at a fast pace. "For India to become a $10-trillion economy and grow at 9-10 per cent, it was imperative for the government to take some bold steps to move towards a less-cash digital economy, and demonetisation was the way forward," he said. Out of the $2-trillion formal economy, 86 per cent was cash, and "more the cash, more (the opportunities for) black economy", he said. Demonetisation would pave the way for financial inclusion and bringing black money into the formal economy, he said. However, he added that demonetisation should not be seen in isolation, as it was a part of a series of measures taken by the government. He said it was a transitory step towards a digital economy with many more reforms, including in taxation, in the works. He said demonetisation could not be seen as a tool to weed out corruption or other ills of the society. On criticism that the move would hit GDP numbers for at least a few quarters, he said economic growth might be hit for two quarters but India was not a corporate entity that had to go just by quarterly growth numbers. "India is a nation and a nation must have a long-term view... look at where will India be 30 years from now," he said. The banks are becoming healthier, inflation will be lower, and tax rates shall go down. "It will take India to a new normal," he said. Kant said demonetisation was a radical step in the right direction and the opposition from economists was a wee bit too early. "It is the first time that an exercise of this scale has been carried out. It is a radical measure never taken in any country. There is no real example or empirical evidence for them to base their assumptions on." Kant said a country cannot grow without disruption. "Only 1 per cent people in India pay taxes. The digital push will curb the black economy and help the formal economy grow. This will lead to money going into areas such as health, education and rural." Kant also hinted at more tough measures on political funding and taxation/real estate reforms. "These are all logical consequences of increasing the ease of doing business and increasing transparency and accountability." He said the government was incentivising people to move towards digital transactions through cashbacks and other incentives. "The psychological barrier from cash to digital has to be broken. We are targeting larger volumes and lower costs. Soon, digital will be less costly or on a par with cash transactions." "It is important for people to look at it as a long-term measure, and not a short-term knee-jerk reaction for short-term gains. The government is keeping a close watch on each and every development at the ground level, and is modifying the rules as and when necessary to make things easier for the public. The government hopes the cash crunch will not exist beyond 15-20 days," he said. Kant's views did not go unchallenged, with the countrys top economists, while participating in a panel discussion in the evening, questioning his assumptions and optimistic view of the future, especially with regards to the impact on GDP growth. Arvind Virmani, Chairman, Policy Foundation, said the timing of the move was not the most conducive considering the volatility in the global economic scenario and rabi crop sowing. He, though, agreed with Kant that it was difficult to know the impact on GDP growth. "All the estimates thrown around by economists on the impact on GDP growth are mere guesses. Economists make predictions based on past trends but there is no precedence to demonetisation in India," he said. "What I can say to an investor right now is that there is a lot of risk and uncertainty. But what we can also say is, if you have taken a part of the currency out of the system, there will be an impact on economic activity, but once you inject it back, there should be full recovery." "What we know from reports is that discretionary spending is down, profitability of companies has been hit and tax collections in December till now are also down," he said. "The government is short on paper and ink to print the currency, and if things do not improve in the next two-three months, banks will have a problem with non-performing assets and the investment cycle will go down further. We will be staring at a recession." Others were optimistic about the positive spinoffs to the economy due to the fillip to digitisation and the crackdown on black money. "Eleven out of 13 economists I have spoken to have said the impact on GDP growth will be less than 1 per cent. This is just a transitory phase," said Rajiv Kumar, Senior Fellow at Centre for Policy Research. "Undoubtedly the economic activity right now is dented, but when it gets fully formalised, there will be a one-time positive benefit too. This prime minister is not going to leave it (fight against black money) only at this. There is more to come." The jury is still out on any radical change in the mindset of the people or the overall economy. The loudest round of applause was reserved for Subhashish Gangopadhyay, Managing Trustee, IDF, who stressed the need for more equitable laws to remove the possibility of corporates benefitting from special provisions. "Why do we have laws such as the CSR law that anybody with a turnover of at least Rs 5 crore needs to set aside 2 per cent net profit for CSR? Why not have it for everybody, so that companies are not tempted to under-report and stay below Rs 5 crore?" he asked. "We have to stop giving special support. Unless we do that, no amount of reforms will help. We have to treat every citizen and economic entity equally." With millions of Indians irrespective of their economic standing queued up outside banks, perhaps some equity is being achieved.